Once inhabiting every island in the Philippines, the Philippine eagle (Pithecophaga jefferyi) – the world’s longest eagle – now occupies a fraction of its former range and is listed as Critically Endangered by the IUCN. Habitat loss is the eagle’s biggest threat. More than 70 percent of the Philippine’s forests have been cleared since the 1970s to make room for urban and agricultural expansion, pushing the eagles higher into the mountains and fragmenting their available habitat. Satellite data show recent encroachment into primary forest in several areas of remaining eagle habitat. Conservationists say one of these areas – a protected watershed area on the island of Mindanao – is controlled by armed groups, which reap profits from illegal logging enterprises. Eagle habitat further north on the island of Luzon was recently affected a strong typhoon, which hit the east coast of the island in September and which the World Meteorological Association attributed to human-caused climate change. Conservationists worry a national ban on open-pit mining will be overturned, leading to more habitat loss as mining companies rush to exploit gold and copper deposits, and that hydroelectric projects will further reduce nesting sites for the eagles. Its cement wings spanning over 20 feet, the effigy of the Philippine eagle was sculpted in Davao City’s People’s Park to commemorate the country’s national bird and celebrate a time when it wasn’t so rare to see one soaring above. Families gather around the monument, chattering into cell phones and taking “selfies,” the city crowding in on the stone eagle, rising concrete replacing trees, car horns drowning out birdsong. The Philippine eagle (Pithecophaga jefferyi) is the world’s longest eagle species, with a body measuring over 3.3 feet in length. It weighs up to 18 pounds, has a wingspan reaching 6.5 feet, and once populated nearly every island of the archipelago with as many as 1,900 pairs in 1910. But after decades of habitat loss due to the expansion of monocrop plantations, logging, resource extraction such as mining, an human exploding population and increasingly-destructive weather patterns brought on by climate change, Jayson Ibanez, Research Director for the Philippine Eagle Foundation (PEF) tallies its current count to be as low as 400 adult pairs scattered across islands of Luzon, Leyte, Samar and Mindanao. Some conservationists estimate that number to be lower—with as few as 200 individual birds remaining. A Philippine eagle sculpture watches over visitors at the People’s Park in Davao City on the island of Mindanao. Image courtesy of Brad Miller. Known as “The Land of Promise,” Mindanao’s open spaces, hardwood forests, rich soil and mineral wealth have historically attracted settlers from the more populated islands of Luzon and the Visayas. With the settlers also came the corporations, both Filipino and multi-national, eager to dig the copper and gold, fell the trees and plant the newly-denuded land with banana, pineapple, rubber and oil palm. Researchers say companies like Dole and Del Monte pressured the small farmers and indigenous people (called IPs or Lumad) into the highlands, where their slash-and-burn method of farming cleared the land that the timber barons had yet to reach. The drive into the highlands above Davao City begins on the MacArthur Highway, snarled with cars, buses and passenger jeepneys. Once-clear views of Mount Apo are now often blocked by the occasional Golden Arches or huge billboards touting some celebrity. With the population of the Philippines at over 106 million and Davao City with 1.6 million inhabitants, the pressure of people is pushing out, and up, the desire for more shopping malls and air-conditioning produced by coal-fired power plants eating up any open land. “When you introduce development to an area, people will flock there,” says Neriza Agbuya, a Project Officer for the Foundation for the Philippine Environment, a grant-making organization for community-led environmental initiatives. She says much of the land surrounding Davao has been converted from forest land to agricultural to grow banana, coffee, cacao, palm oil and another oil-producing plant called jatropha. 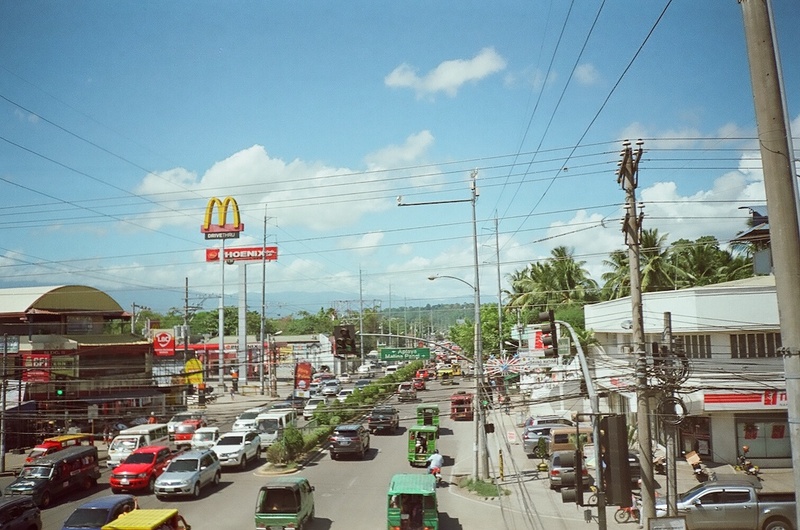 Urban expansion is pushing Davao City into the foothills and watershed of Mount Apo. Image courtesy of Brad Miller. Lately, with the pressure of population, this farmland has been converted to commercial and residential plots, and subsequently, more forests are denuded to make way for farms and plantations. The construction of another new road is planned from Magpet to Davao, passing through the foothills of Mount Apo. “Road construction is an avenue of encroachment,” Ibanez says, “and fragments the continuous habitat of the Philippine eagle.” On a national level, nearly 80 percent of Philippine tropical rainforests have been deforested since the 1970s to make way for urban and agricultural development. By stabilizing soil and reducing erosion, moderating floods and droughts, and moderating water flow, forests play a pivotal role in maintaining watersheds – and, thus, the water supplies of nearby communities. Davaoenos like to boast about how you can drink the water right out of the tap, but the city’s watershed is under continual threat due to overpopulation, land conversion, illegal timber collection and the expansion of mono-crop plantations, despite the Watershed Code passed by the Davao City Council in 2007 that prohibits development in the highland’s environmentally-critical areas. In their study, the researchers note that “logging removed high-grade timber, making secondary forests vulnerable to land conversion. Settlements have flourished and upland agriculture with it.” According to the study, data published by the National Mapping and Resource Information Authority (NAMRIA) show that in 2012 the Talomo-Lipadas watershed had only 18 percent of its forest cover remaining. Denudation in the Mount Apo foothills in Santa Cruz, Davao del Sur. Image courtesy of Brad Miller. The accompanying “expansion of banana plantations has been a serious concern in the watersheds” the PEF researchers write in their study. “It may not only cause extensive loss of habitats and wildlife due to haphazard land conversion but also bring hazards to public health because of pollution from pesticides.” The research team found 13 different forms of pesticide residue in the rivers, six of which were banned chemicals. The study also found that by 2005, the Department of Environment and Natural Resources-Environmental Management Bureau (DENR-EMB) had grantedEnvironmental Compliance Certificates to banana corporations for over 4,000 hectares in the watershed in the districts of Calinan, Tugbok, Baguio, Toril and Marilog—including the plantations of Stanfilco, a subsidiary of Dole, the Japanese company Sumifru and the Filipino-owned Highland Banana Corporation and DAVCO (Davao Agricultural Ventures Corporation). “Agricultural encroachments into the conservation zone have been reported at Sirib, Tamayong, Daliaon Plantation and Manuel Guianga,” the researchers write, and there has been “rapid expansion of large-scale commercial plantations in the hilly portions” of several of these villages. In Sirib, Calinan, in the foothills above Davao, where the wind carries the occasional whine of a chainsaw across a vast sea of green banana trees, a villager named Lolong points to where a lone hardwood tree used to stand. He says it fell victim to a banana company’s illegal land-clearing activities. NAMRIA data show that the Philippine’s forest cover has gone from 70 percent in 1900 to only 24 percent by the end of the 21stcentury. Primary, or old growth, forest cover is estimated by the United Nation’s Food and Agriculture Organization (FAO) to be down to 11 percent of its original acreage. And that was in 2015. Even with an executive order banning timber harvesting in natural forests without a special permit, the trees keep falling. 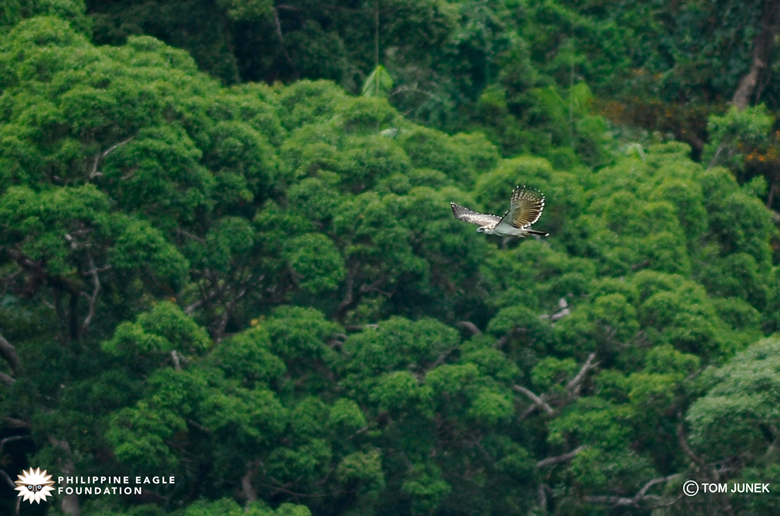 A Philippine eagle soars over rainforest. Photo courtesy of Tom Junek / Philippine Eagle Foundation. Part of this, according to Rogelio Abalus, an executive assistant who aided Compostela Valley’s Governor Arturo Uy in creating a regional “Anti-Illegal Logging Task Force” in 2008, is that the forest rangers working for the DENR are understaffed and unarmed. Since many of those illegally cutting timber belong to armed groups—either government security forces or those battling them—and often carry automatic weapons as well as chainsaws, protecting the Philippine’s remaining forests in some regions has been very difficult. One such area is the Lake Lanao Watershed Forest Reserve. 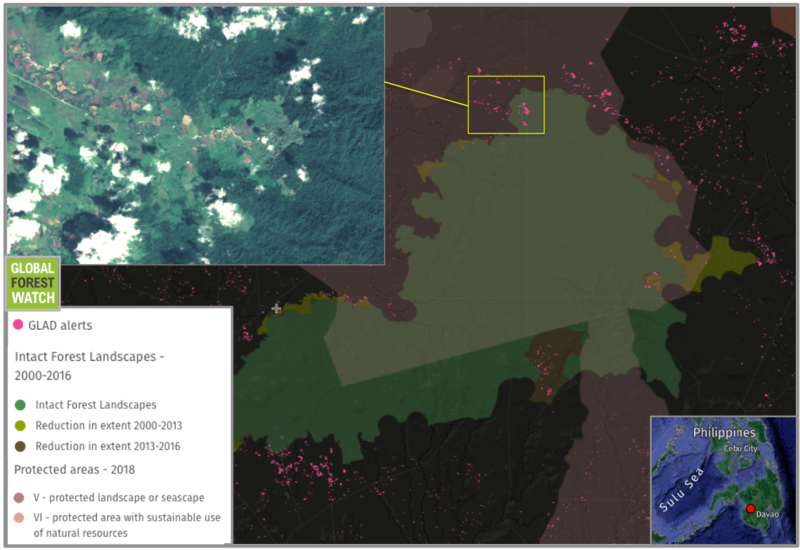 It is here that satellite data show an alarming amount of recent denudation activity, with the forest monitoring platform Global Forest Watch marking deforestation with bright pink squares. Unfortunately on-the-ground data has been harder to obtain. Neriza Agbuya says the Foundation for the Philippine Environment funded several projects in the Lake Lanao watershed around 2002, but they were discontinued because they were too difficult to visit and monitor. Agbuya says the area is controlled by armed groups, the profits from any illegal logging enterprises going to their leaders. Satellite data collected from the Global Land Analysis and Discovery (GLAD) lab at the University of Maryland show recent areas of tree cover loss occurred between September and December in Lake Lanao Forest Watershed Reserve. The reserve protects one of Mindanao’s last remaining intact forest landscapes, which are areas of primary forest that are connected and undisturbed enough to retain their original biodiversity. To mitigate the lack of monitoring and enforcement in the forests, the Philippine Eagle Foundation, while best known for its breeding program and advocacy for the bird’s survival, is now active in working with the Lumad communities of Mount Apo and Davao City regions to help them manage their own ecosystems. Ibanez says they are “re-channeling conservation funds for green jobs for the IPs,” including employment as forest guards. He says there are almost 400 un-armed guards monitoring 40,000 hectares of land, a superior ratio of guards to land area than in other parts of the country. Datu (tribal leader) Hernan Ambe of the Bagobo-Tagabawa people says that after their guards started patrolling, violations of timber poaching and other illegal activities were reduced by 80 percent. 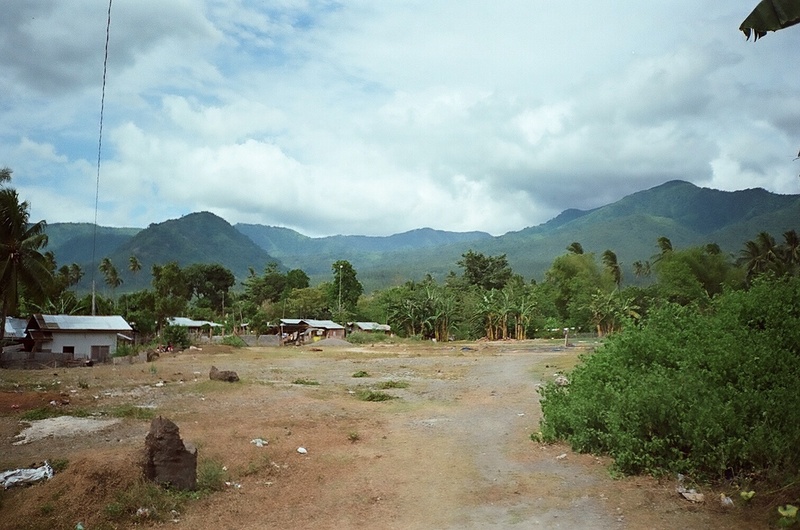 They have established their home of Sibulan as an organic zone and have been able to keep the large corporations at bay, unlike other villages like Kapatagan, Davao del Sur, where Ibanez and Ambe say monocrop banana plantations have been able to invade and expand—in violation of the laws created to protect the Mount Apo Key Biodiversity Area. By creating a system of managing the ecosystem based on the Lumad’s cultural belief that the environment is the source of life, Ibanez thinks they can implement conservation practices that help the eagle’s chances of survival and also improve the quality of life for people inhabiting poor and marginalized villages. Some officials like Rogelio Abalus believe the biggest cause of deforestation is the collection of fuel wood by farmers and tribal communities that populate the highlands in ever increasing numbers. But others, like Keith Bacongco, who worked as a paralegal with the Legal Rights and Natural Resources Center, attributes it more to corporations like Australian-owned BHP-Billiton, which operated an open-pit nickel mine in Davao Oriental until it sold its interests to its local partner in 2009. “They say they needed to clear the area, but it is the workers that are selling the logs and the lumber,” he told IPS News. As of press time, BHP had not responded to an e-mail inquiring about any deforestation that had taken place during the period when they operated the nickel mine. While there is currently a national ban on open-pit mining, the Chamber of Mines of the Philippines has been lobbying hard for it to be lifted so three large copper and gold mines can begin operating in Mindanao. Researchers worry this would set the stage for more deforestation and destruction of the Philippine eagle’s habitat. Even now, “there is known eagle habitat being mined,” in some provinces of Mindanao, Ibanez says. 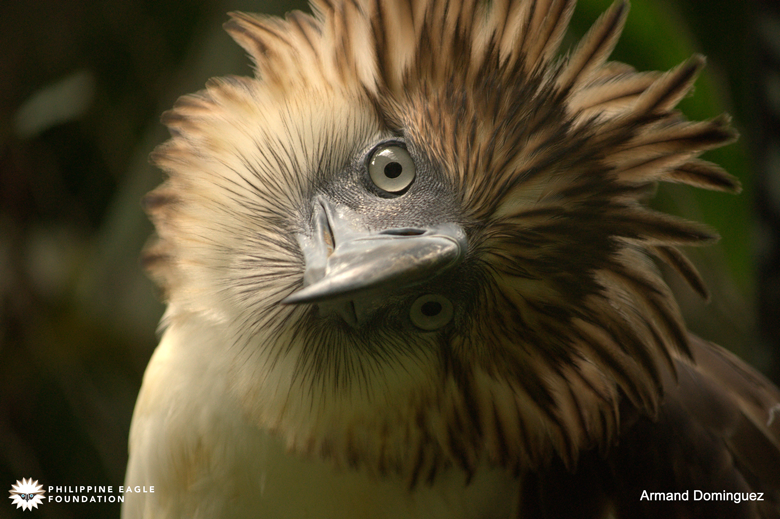 A Philippine eagle shows off its expressive neck feathers. Photo courtesy of Armand Dominguez / Philippine Eagle Foundation. Environmental groups are also concerned with habitat loss due to the construction of mega-dams. The Foundation for the Philippine Environment and Save Pulangi Alliance have already noted the negative effects of a series of hydroelectric dams built along the Pulangi River in Bukidnon Province in Mindanao—not just the inundation and loss of land they have caused, but the deforestation that occurred during the construction of roads and infrastructure and pollution of the river caused by increased industrialization. The Pulangi River watershed is a known nesting area for the Philippine eagle. If the individual destructive activities of humans weren’t enough to imperil the survival of the Philippine eagle, the sum total could be decisive. The World Meteorological Organization (WMO) has noted a definitive change in climate, with weather becoming more severe as the emission of man-made greenhouse gases continues. The WMO added that more severe weather patterns have in turn inflicted erosion, flooding and damage by high-level typhoons. Satellite data show widespread forest damage from the Category 5 typhoon Mangkhut, which hit northern Luzon in September 2018. Much of this damage occurred in the Philippine eagle’s remaining range. Ibanez visited an area hit by the typhoon and noted that the damage he saw was largely defoliation – the loss of leaves – rather than the toppling of trees. He said large, continuous tracts of forest can recover from defoliation in a couple years. But smaller, more isolated forests don’t fare so well. 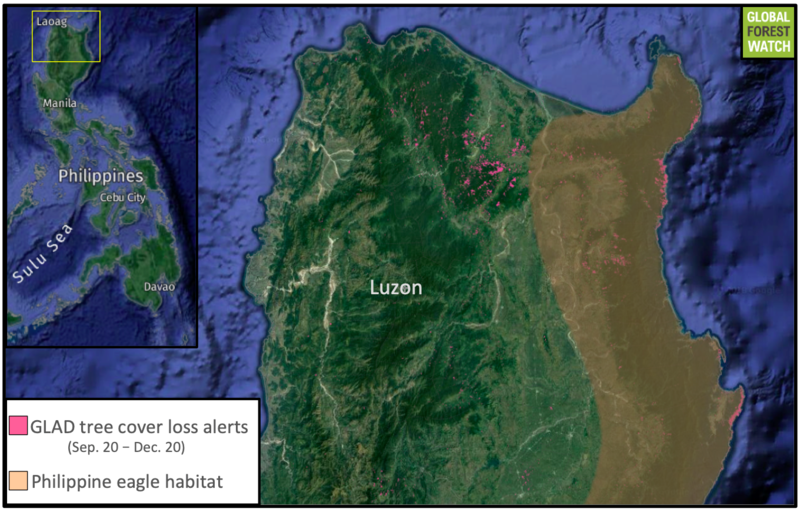 Satellite data from the GLAD lab at the University of Maryland and visualized on Global Forest Watch recorded several areas of dramatic tree cover loss after Luzon was hit by Typhoon Mangkhut in September. Forest fragmentation is one of the leading overall threats to Philippine eagles, according to the latest assessment of the species by the International Union for the Conservation of Nature and Natural Resources (IUCN). Ibanez said more research needs to be done, but that severe storms like Mangkhut coupled with habitat fragmentation could “theoretically” affect eagle populations. The Peregrine Fund considers the Philippine eagle an “umbrella species,” meaning that “conserving Philippine eagles and their habitat automatically provides protection for all the other plants and animals that live there too.” This would include the 780 plant and animal species in the Philippines that are listed as “Threatened” on the IUCN Red List, including the critically endangered freshwater crocodile, tamaraw, Walden’s hornbill, Philippine cockatoo and the Philippine forest turtle. 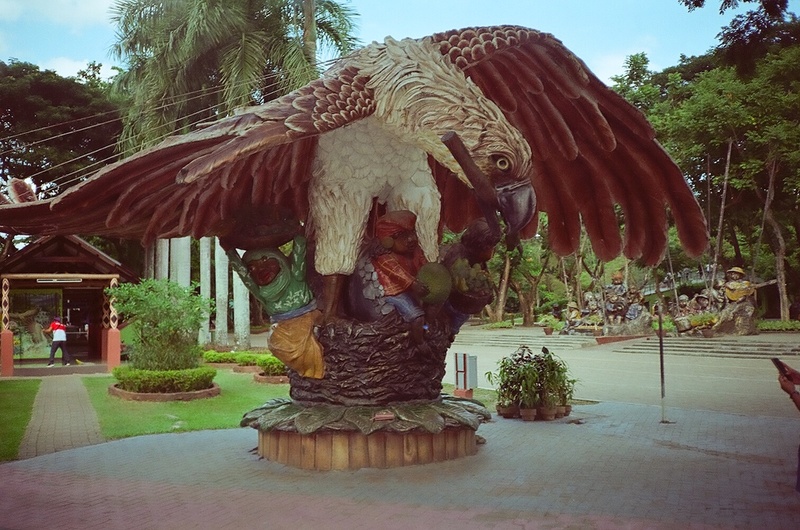 In Davao’s People’s Park, the wings of the Philippine eagle form a wide umbrella, sheltering the sculptures underneath—those of several tribal people carrying baskets of produce. There is a path that passes in front of the eagle, the bricks inlaid with square lights. At night the lights flash yellow, blue, green and red, turning bright pink as they approach the bird. Cover image: Philippine eagles are the longest eagles in the world. Image courtesy of the Philippine Eagle Foundation.